Anytime is the perfect time to make that appointment to get your pets spayed or neutered. Cats and dogs give birth in the spring. If you spay or neuter your pets you will be making a significant contribution towards the prevention of pet overpopulation. An estimated five million cats and dogs are killed in shelters in the United States each year. That’s one killed every six seconds! By spaying and neutering your pets, you can help reduce the suffering and needless deaths of unwanted animals. Cats and dogs as young as six months can become pregnant, and they can have two litters per year. Avoid unwanted teenage pregnancies. 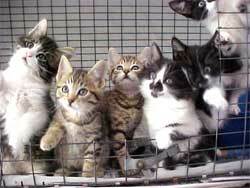 Spay and neuter your pets before they are six months old.